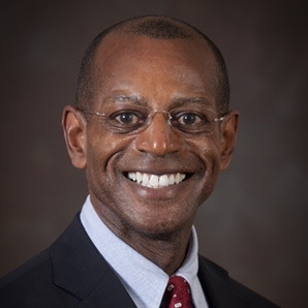 Dr. James C. Wimbush is vice president for diversity, equity, and multicultural affairs, dean of the University Graduate School, and professor of business administration at Indiana University. As dean, he oversees graduate master’s and doctoral programs on Indiana University’s eight campuses. Nationally, he works to advance graduate education by serving as past-chair of the board of directors of the GRE; chair-elect of the Council of Graduate Schools’ board of directors; and as a member of the executive committee of the AAU’s Association of Graduate Schools. He was appointed to the joint Commission on the Future of Graduate Education, which released the 2010 report The Path Forward: The Future of Graduate Education in the United States. In 2011 he was appointed to the Commission on Pathways through Graduate School and Into Careers—which released the 2012 report Pathways Through Graduate School and Into Careers. A professor of business administration at Indiana University since 1991, Dr. Wimbush is former chair of various units in the Kelley School of Business, including the Department of Management; doctoral programs in business; and the full-time residential M.B.A. program. He is also former associate dean of the faculties for the Bloomington campus. Dr. Wimbush has received multiple awards for his teaching of management and leadership. As an acknowledged national authority, he has published numerous articles and book chapters related to ethics in employment settings. Dr. Wimbush earned a Ph.D. degree in management and a master's degree in human resources management and industrial and labor relations from Virginia Tech.